Given the storied history of ‘funny books’ in the annals of sequential art, it’s perhaps a little surprising that so many quote-unquote “comedy” comics these days aren’t, y’know, funny. 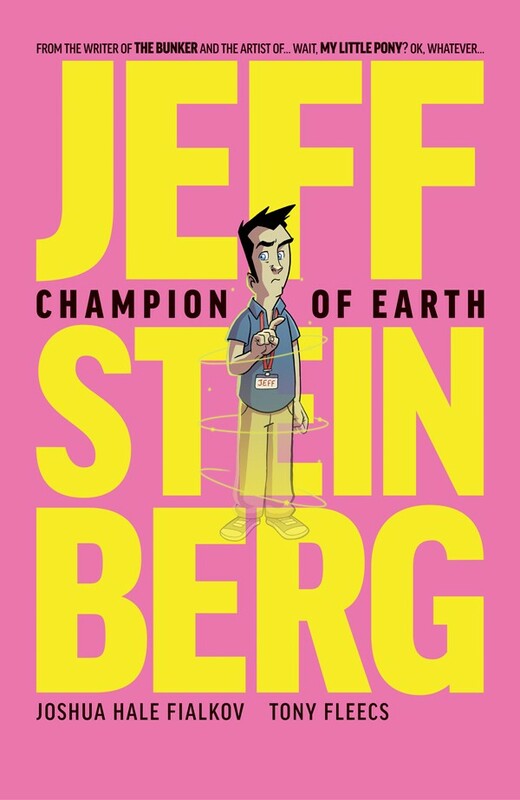 Thankfully, Joshua Hale Fialkov and Tony Fleecs are on hand to remedy all that with the gloriously absurd Jeff Steinberg: Champion of Earth, on sale this week from Oni Press. The story, as you might expect, is based around a thoroughly unremarkable guy named Jeff Steinberg who, you guessed it, unwittingly becomes the de facto Champion of Earth when an alien invasion comes calling. Fialkov and Fleecs have a great vibe going on here, mixing brilliant characters who are instantly recognisable from our own lives (Jeff’s flatmates Jimmy and Sienna, for instance) with copious amounts of pop culture references (The Karate Kid, the age-old debate (?) between Dave and the American President, the brilliance of Windows ME) and some affectionate swipes at well-established science fiction tropes. It feels what would happen if Kevin Smith directed an Independence Day sequel and made a video store clerk the hero. Hang on… are video stores still a thing? The humour can be a little hit and miss at times, as you might expect. For every moment of sheer unbridled comedy genius along the way (Rolo inexplicably losing his pants had me in stitches), there’s another where the joke doesn’t quite land as well as it should (the bulk of President Obama’s shtick, sadly). There’s also the fact that the entire set-up for the first issue is based around a fairly broad gag which is likely to elicit just as many eye rolls as it does euphoric air punches. Thankfully, the innate likeability of the lead – not to mention Fialkov and Fleecs brilliant comedy timing and delivery – ensures that there’s a lot more ‘hit’ than ‘miss’ here, keeping the pages turning and the smile firmly in place from start to finish. Artistically, Fleecs makes an impressive transition from the world of My Little Pony to the realm of two-legged characters, with some brilliant character designs and a keen gift for comedy moments. He gives the alien invasion the sense of spectacle it deserves while simultaneously making sure things don’t ever get too serious (like, not even close to serious), and shows some wonderfully cartoony flair during the more terrestrial scenes. Oh, and if that’s not enough, this first issue is double-sized, which really helps Fialkov and Fleecs lay out their stall for the series to come, introducing the wide assortment of characters in a relaxed, casual manner. Plus, with Fialkov suggesting that Jeff’s trials are going to be based loosely on the trials of Hercules, the sheer wealth of comic potential that offers up is difficult not to get excited about. If you’re the kind of person who reads your comics while wearing a top hat and monocle, it’s possible that some of the humour here could be considered a bit “low brow”, but for the rest of us, Jeff Steinberg offers up a hilariously irreverent look at what would happen if that one unremarkable guy you sorta know somehow became planet Earth’s only hope to avoid destruction. And I think that’s an concept we can all get behind.